Stephen Maguire said he was "embarrassed" at not being able to motivate himself for the World Championship at the Crucible. 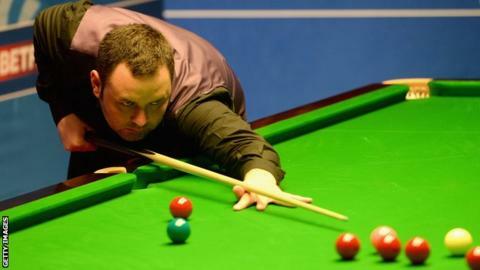 Maguire, 35, lost 10-7 to fellow Scot Alan McManus, his fourth consecutive first-round defeat in Sheffield. "I didn't feel anything," said the two-time semi-finalist. "It's terrible. "It's embarrassing that you can't get up for a match at the World Championship, especially being lucky enough to actually qualify for it." He added: "I need to look at things, I think. I'll maybe need to speak to someone. When I qualified, I was over the moon. How can I possibly go out there as if I don't care? So there's something wrong." Maguire, who qualified by reaching the China Open semi-finals, said he had tried everything to "fire myself up" for his 13th successive appearance at the Crucible. "Yesterday I was looking forward to it," he said. "Today I was up for it, but as soon as I got out there I missed one ball and I just go 'whatever'." He added: "I stamp my cue once and the referee has a go at me. You're not allowed to care in this game. Alan played better, so he deserved to win. I just never showed up over the two days." Maguire, who has been as high as two in the world rankings, said he was "just not good enough" from the start of the match and felt "flat". "I played better in the first four frames than I did for the rest of the match," he said. "But it was still taking me two or three chances to win a frame." McManus, who will face Ali Carter in the second round on Thursday, had sympathy for his close friend. "He'll be back and I feel for him," said McManus. "He's had some tough runs here. I'm going to have a blether with him, because he's such a good player. "I'll get him back hungry. When he's hungry, he's an unbelievable animal."